The first week of December means Christmas performances and train shows around the metro. 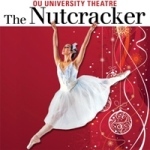 The University of Oklahoma’s Oklahoma Festival Ballet in conjunction with University Theatre presents “The Nutcracker” from December 2nd through the 11th. Performances take place in the Rupel Jones Theatre on the OU Norman campus. Only once every four years, the University of Oklahoma presents this Christmas ballet featuring elaborate costumes and sets, and over 100 dancers. Tchaikovsky’s score is choreographed for Oklahoma Festival Ballet by Mary Margaret Holt. The OU Symphony Orchestra performs live with OFB during shows on the 2nd, 3rd, and 4th. The Oklahoma City Philharmonic performs “A Christmas Show” from December 1st through 3rd at the Civic Center Music Hall in Oklahoma City. Previously known as “A Very Merry Pops,” this performance of holiday favorites through song and dance has become an annual staple at the Civic Center. Judy McLane returns as host this year after hosting in 2009. The OKC Philharmonic considers “A Christmas Show” its Christmas gift to the metro community. The 35th Annual Oklahoma Christmas Train Show is December 3rd and 4th in the Transportation Building of the Oklahoma State Fairgrounds. Model trains fill 100,000 square feet filled of the building, with an area where children can play. Train sets will be won hourly through the fourth annual “Great Train Set Giveaway.” Vendors attending the train show include the Oklahoma Railway Museum, the Railway and Locomotive Historical Society, and Tulsa Train Exchange. The Christmas Train Show is open from 9 a.m. to 5 p.m. on Saturday and 11 a.m. to 5 p.m. on Sunday. The OU Christmas Holiday Sing-A-Long Concert brings together the OU choirs, brass ensemble, percussion ensemble, and organist Dr. John Schwandt for an evening of holiday music. The Mesta Park Holiday Homes Tour provides a unique at one of Oklahoma City’s historic neighborhoods decorated for Christmas. And David Bazan and Sheree Chamberlin perform at The Opolis in Norman on Sunday. For more Christmas events, log on to our calendar page.